Shops with beads of miniature lights hung from the ceiling; the homes with earthen diyas filled with oil, lit up, the flame ever so flickering and yet over a hundred of them being enough to light up a home; the delicious scent of flower petals spread everywhere and the fragrant, holy smoke of the incense sticks providing relief from the pollution all around; the great Indian festival of Diwali, also known as Deepawali, is celebrated with whole hearted enthusiasm and devotion in Rajasthan as in the rest of India. In cities, Diwali in Rajasthan is celebrated for 5 continuous days, starting from the festival of Dhanteras, followed by Choti Diwali, Badi Diwali (the main festival), Padwa, and Bhaiduj. Every city of Rajasthan has a unique ardor and although the underlying theme of colors, lights, and celebration is recurrent for Diwali, each of these has its own noteworthy way of giving the festival a personal touch. Being in Jaisalmer during Diwali is a treat to the senses. It is always a colorful, magical place. But if you are fortunate enough to visit it during Diwali, you will see it at its finest. The Golden City shimmers in lights of earthen lamps, artificial lights, bonfires, flowers, and sweets. The highlight of the evening is the Diwali parade marching through the narrow streets of the city. Every person present there takes part in this spectacle of dancing, music, camels, and confetti. All you see are people in brightly colored clothing, celebrating. Jaipur, the Rajasthani capital, celebrates Diwali with much pomp and show. 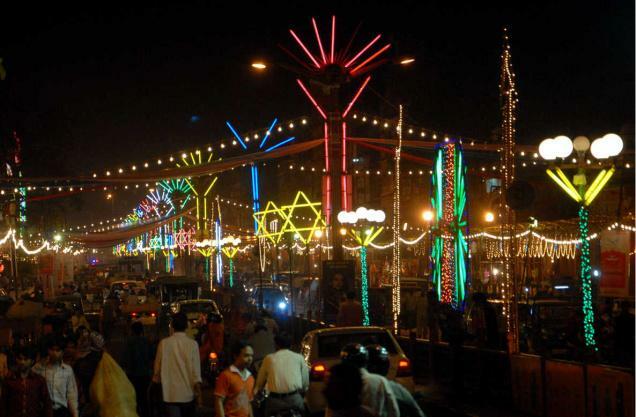 Not just households or buildings are adorned with lights; the markets are decked up too. The walled part of the city is covered with lights from end to end. The illuminated markets such as Bapu Bazar and Johri bazaar are filled with fine looking handicrafts and jewellery, and the streets filled with happy customers eager to shop as much as they can for the festival. Every year, there is a competition for the most brilliantly lit up and the best decorated market in Jaipur and the government pays the electricity bill. The holy town of Pushkar doesn’t have an overwhelming crowd during the festival. It prides itself in being a relaxed and slow-paced town and doesn’t change much in its demeanor during Diwali. The streets and homes are decorated but the highlight is the Pushkar lake which is lit up with diyas (earthen lamps) on the periphery. While the town is lit up for Diwali, it is gearing up for the biggest, centuries old festival it is famous for- the Pushkar camel fair. The fair sees more than 50,000 visitors during the 5-day festivities. The most important part of the fair, the cattle trading, takes place in the first three days and the common shows, folk dances, and the camel race take centre stage in the later days. 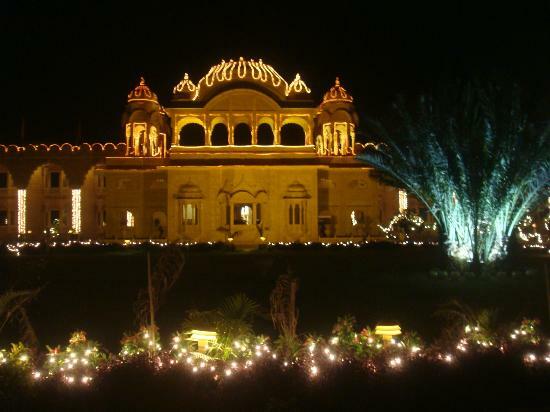 Leave it to the citizens of Udaipur to celebrate Diwali in a royal way; they will never disappoint. The city of lakes is filled with lights on every street, every home. 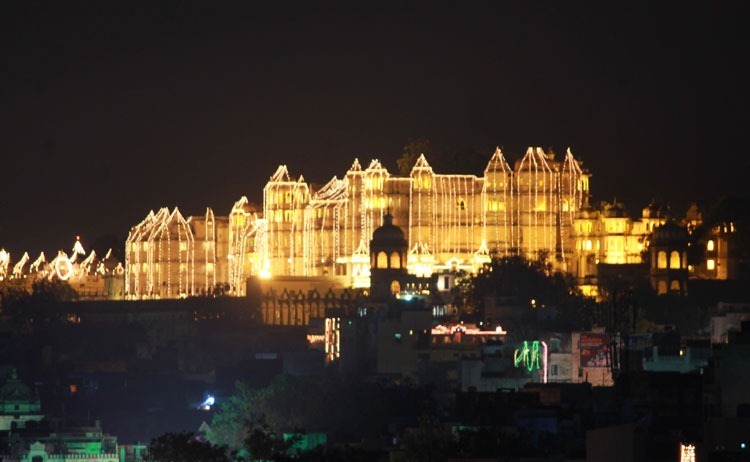 The City Palace of Udaipur is a gleaming edifice which stands out from the rest, more so on Diwali. On the other hand, villages in Rajasthan celebrate a simpler Diwali. Affluent families prepare the signature dish of Rajasthan- Dal, Baati, Choorma. The farmers in the villages make plain rice which is eaten with Boora, which is powdered sugar. The people dress up in new clothes on this day- the men in Kurtas and Dhotis and the women in Lehngas. 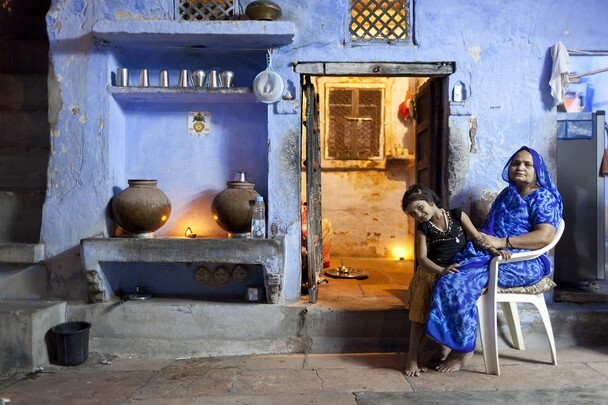 The highlight of the day is when everyone gathers in the evening, light up their home with a few earthen lamps; say their customary prayers and sits together for the family dinner. The stories narrated, the laughter emanated and the food shared is what Diwali is all about to these humble beings.